So you take 30 radios. Imagine each one turned inside out and then obsessively rearranged, piece-by-piece, into variations on a theme: a spindly list of antennae stalking the wall, a clod of speakers dangling by their cords, an array of circuit boards with their unintelligible bleeps of light and tiny studs of gold, etc. Press the button in the middle of the floor and you are bathed in sound. It’s hard to untangle the wires, exactly, in this installation by Oscar Ferreiro at Westspace. The work is called Present Tense and it’s a fairly concrete experience. 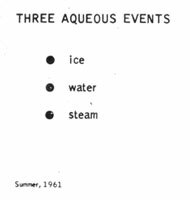 Concrete in terms of the irreducibility of experience to words, of function to form. The thirty radios, for example, are no longer recognisably radios, but they’re still functioning. Distilled radios. Form and function are collided in this work to the extent that it can scarcely be performed, except in your head. The work welds together shape and process, space and time. Present Tense pulls in the opposite direction. These radios don’t look like a radios – their spatiality has gone AWOL. Meanwhile, their ability to act like radios – to create sound across time – has become essential to their identity. Present Tense separates form and function, shape and process, and space and time. But in the process, both sets of terms are transformed into a new aesthetic ambience that’s really just charming. 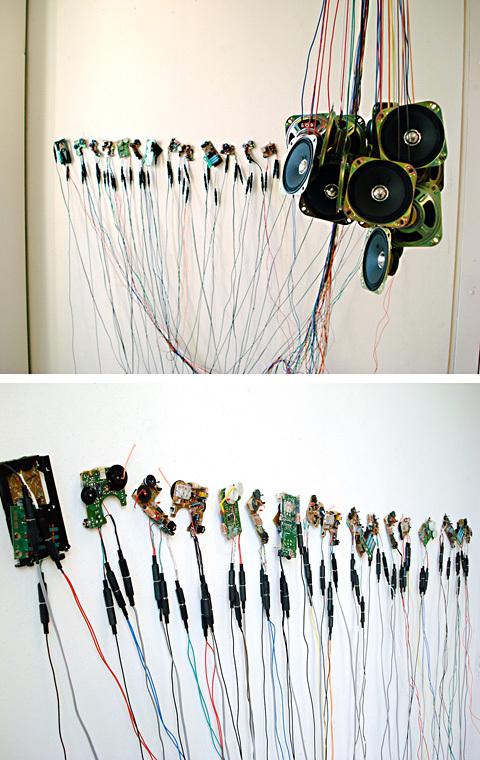 The messy wires connecting each part to the next are charming, the clunky button that sets off the sound is charming. Have I fallen for a fashionable nostalgia for oldschool analogue technology? Maybe. I used to take destructive joy in pulling apart my parent’s classical music tapes when I was a kid, trying to find the symphonies in the black plastic ribbon. And isn’t that the very strange thing about technology – the fact that a box with some twiddly dials can hide such magical properties? Ferreiro takes it all apart and puts it all together again in a way that’s neat and whimsical. You end up being enbalmed by waves of static punctuated by snippets of fuzzy music and speech. Here, media technology acquires a new joy by becoming slightly useless. Am now wondering what it would do to my laptop if I take my keyboard and stick it on my bedroom wall, my screen on the ceiling, and use my circuitboard to line the skirting of my windows? That’s amazing! It’s great they still play, must have been tense work taking them apart. I wonder what the system is to the different colours of wire radio manufacturers use, they look great all mixed up and drawn out thin on the white wall. Would be fun if he had a monochromatic version, all white maybe like packing string. And then the various components would look much less connected, too. Not sure if that is a good thing or not! I really like the way you started this entry – it felt like I was there experiencing it with you. Really interesting work though I must say that your description and theorizing of it is far more enticing than the images of the work itself.